I have always maintained, through this blog and conversations with non-Germans, that there is more to Germany than Lederhosen, Bier and Wurst. I have looked at politics, education and German humour, in an attempt to prove that the stereotypical view we have of the Bundesrepublik Deutschland is too simplistic and frequently inaccurate and to believe that only three things can define a nation is doing our Teutonic cousins a disservice. They are more than leather clad beer swillers with pockets full of pork products. Despite my best efforts, once the Fest season rolls around, my position becomes incredibly hard to defend. As trains, cars, buses and trams make their way through every conceivable German municipality, packed with Germans heading to Feste, Germany becomes more stereotypically German, even if it is only temporarily. “They all look like Snow White” he said, awestruck. “The women...they all look like Snow White”. I fully understand the sentiment. Erlangen Bergkirchweih does have the effect of feeling like you have accidentally intruded on a forgotten Grimm’s Fairy Tale. Located as it is on a hill, covered by a forest of Chestnut, Linden and Oak trees bedecked with paper lamps and fairy lights, it radiates a sense of an older Germany, the Germany of 200 years ago. This isn’t really a surprise, given that the festival itself is over 260 years old and the same festival site has been used since 1798 . Of course, things have changed slightly since its inauguration. I am fairly confident the founders of Kirchweih never anticipated giant sound systems blaring out saccharin Schlager music or groups of revellers capturing their enjoyment via the medium of selfie-stick. Despite these more troubling innovations, there has been some modernisation that has only improved the experience, such as the introduction of toilets in 1897, or the prohibition on throwing beer glasses in 1923. I may abhor Helene Fischer, but at least I know no one is going to glass me. Bergkirchweih still has many traditional aspects though. The family owned beer cellars running under the hill, initially used for storing beer in the summer months, continue to be used as temporary bars. The festival is always opened by the Mayor, who has the honour of tapping the first barrel and pouring the first mass of beer and the end of the Fest is still marked by the funeral like burial of the last keg of beer on the final day. Tradition is at the heart of many of the Feste throughout Bavaria and Germany as a whole. Although many, excluding the more wizened of the community, would be hard pressed to explain the origins of their local celebrations, they are still incredibly well attended, with the smaller Dorffeste seeing whole villages in attendance. Outside of Germany, Oktoberfest is considered the most important event in the calendar, but from my own experience, there is a general belief that the most famous of all the Feste has become too commercialised and to really find the true German Feste experience, visitors must make their way to the towns and villages of Germany. 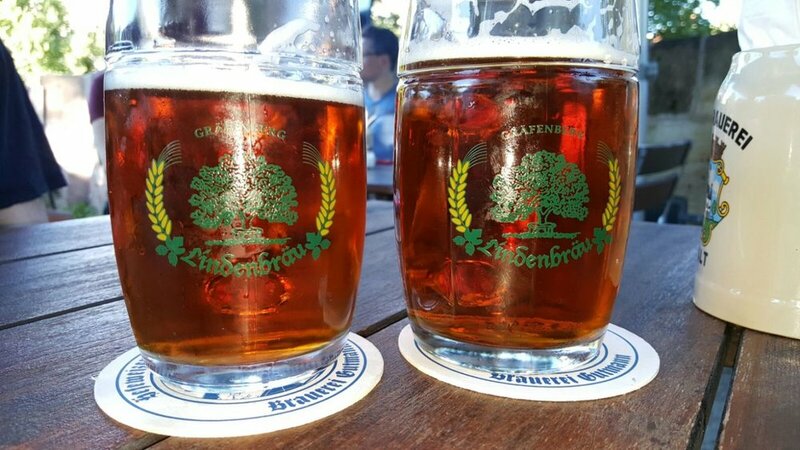 It is here that the Blasmusik, possibly played by multiple generations of the same family, can be heard and the exceptionally strong Festbier can be drunk for at more affordable prices. At this point, I will sound a note of caution; when you find a mass of bier for only €6.50, this is not a challenge. The idea of drinking five litres of 7% beer and eating a wealth of pork might sound like a good idea at the time, but come 11 pm, things can get unfeasibly messy. I have ruined more than one pair of shoes making that mistake. Furthermore, the moment someone suggests getting a round of schnapps, extricate yourself as quickly as possible. The greatest scientists in the world have yet to concoct a washing powder that can get a mixture of Currywurst, Birnenschnaps and Festbier out of your clothing. The German enjoyment of Feste has also led to the creation of less traditional events and during the summer months it feels like there is a celebration of one kind or another every week. Sommerfest, Jazzfest, Barockfest, slow-week-fest, whatever people feel like celebrating can be an excuse to put up the benches, hire a band and spend all day drinking. I am not complaining, there is nothing more enjoyable than going for a walk, turning a corner and finding half the city holding their beer glasses aloft and singing in unison to some old-timey drinking song. It should be noted at this point that Blasmusik and Schlager may dominate much of the sounds of a Fest throughout the day, but when it gets dark and the horns and clarinets have been cleared away, there is a serious shift in styles. There is no stranger sight at a festival than to hear AC/DC being belted out by a tribute band, while hundreds of people, dressed in Lederhosen and Dirndl give virtuoso performances on air guitar. This might come second only to the moment this year where I witnessed a packed tent at the Nürnberg Volksfest erupt in unison to the band playing the first bars of Nena’s eighties hit 99 Luftballons, that was something to behold. The world may turn its attention to Munich during September and believe they are witnessing the true expression of German culture and I suppose to some extent they are. Oktoberfest has the adoration of thousands of visitors, but to really appreciate the Fest period in Germany, it is necessary to leave the confines of Germany’s second city and find yourself a small village, a local band and an affordable mass of beer. This is where I will most likely be, attempting to sing some repetitive German drinking song, while balanced precariously atop a rickety wooden bench. This time, I am sure, I won’t fall off.